The Bethlehem Nativity is part of our Holy Land Series, a body of artwork created from actual biblical locations in Israel to create authentic artwork of the places where the Savior spent his life. In Bethlehem, below the Church (Basilica) of the Nativity, is a silver star marking the traditional site of the birth of Jesus Christ. The manger is not a made of wood like a stable that we normally think of, but is instead considered to be a grotto, or cave, that would have been used to shelter the animals in that time period. The cave system still exists and the some of the cave rooms are used for chapels and tombs . For this Nativity project I used one of these cave rooms under the Church of the Nativity for the background. The windows were added to allow for a view of Bethlehem, and to include the light of the guiding star. Of note is the window that shows the star is actually the image of the same window found in the Garden Tomb. In addition to the cave, all of the animals are native to the area. The cows, sheep, goats, and donkey I photographed in the area between Galilee and Bethlehem. 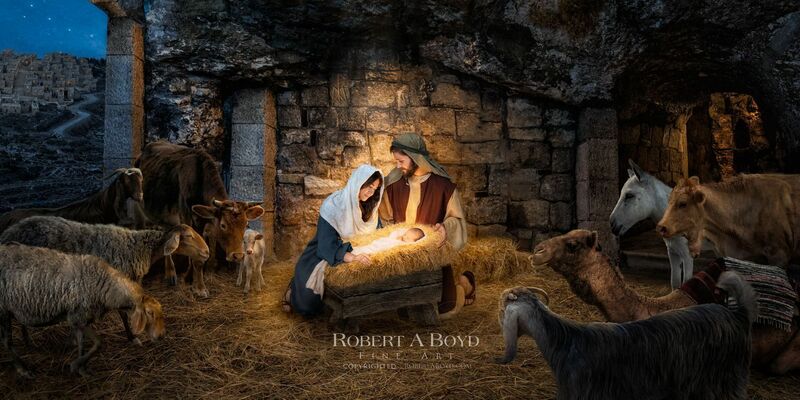 The fantastic models for Mary and Joseph are Jenna Walker and Balint Moreland, who are both currently away serving LDS missions in Japan and England, respectively. I'm also grateful to Robin Mather and son Liam, who was only 15 days old when he modeled for the photo shoot. And Christy Wardell did an amazing job with the wardrobes.